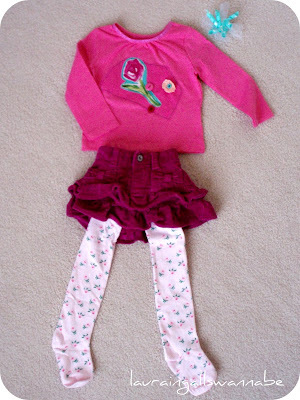 I found some sweet little rose-covered tights for Margaret at, of all places, Wal-Mart last week. They were inexpensive, and I thought they'd be cute for Valentine's Day. I picked up a hot pink shirt to go with them, and I figured she could wear it all with magenta corduroy skirt she already has. 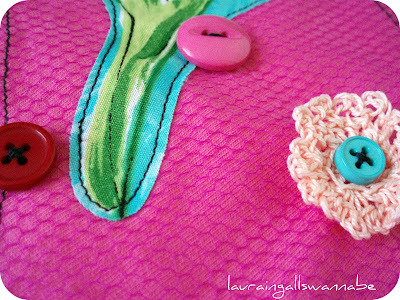 I wanted the Valentine's shirt to be deliciously gaudy (as everything Valentine's Day should be) so I cut out a loud rose from some fabric I had on hand, tossed it on some magenta net to tie it in to the skirt, and sprinkled on some buttons and a crocheted flower. 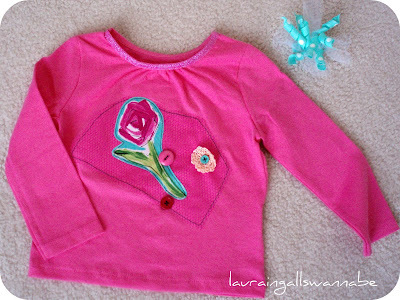 I stitched around all the elements in black thread to mimic the outline of the rose. I also made her a simple korker bow to go along with it. Korkers are so easy to make. I just wrapped some grosgrain ribbon around a pencil, tied the ends with thread to keep the ribbon in place, spritzed it with water then spray starch, and popped it in the oven at 225 F for about 20 minutes. Once the ribbon was curled, I cut lengths of it and hot glued it to a hair clip. 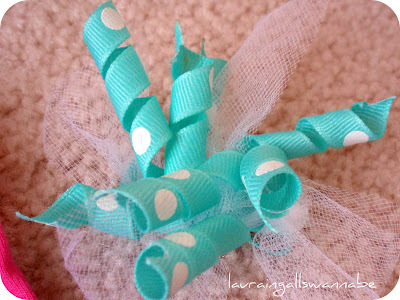 I also added some white tulle loops for... I don't know, kitsch. You can use more ribbon lengths than I did for a fuller bow. (I used about 2 pencils worth here. I like it a little daintier than the typical korker style seems to be.) When I had it assembled how I wanted, I sprayed it with starch again and hung it upside-down to dry.